BIG SALE!! 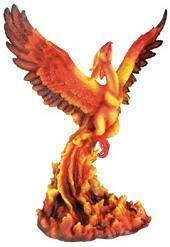 Phoenix & Egyptian Statues $3.95+ BIG SALE!! Hand painted gold figurine of Bastet, the Temple Cat on a brown base etched with hieroglyphics. Reverence for the Sacredness of cats originated in Ancient Egypt. Bastet, the Cat-mother of the city of Bubastis was the benevolent aspect of Goddess Hathor the Sphinx. An Egyptian artifact at a fraction of Las Vegas or Museum store prices!! 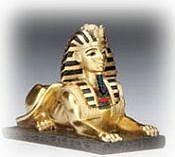 Hand painted gold figurine of an Egyptian Sphinx, based on the Great Sphinx of Giza near the great pyramids. The Great Sphinx, which has the face of a Pharaoh and the body of a lion, is believed to be far older than the pyramids and part of a pre-Egyptian culture. The sphinx captured the imagination of the ancient Greeks, Renaissance artists and modern day mystics with its still hidden esoteric meaning. Stunning hand painted gold figurine of young Pharaoh Tutankhamen bust on a brown base etched with hieroglyphics. 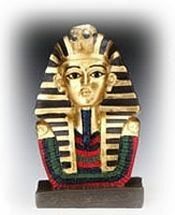 This King Tut Bust has vivid gold, red and black colors which make a bold decor statement. A hand painted figurine of the kneeling Winged Isis on a brown base etched with hieroglyphics. Isis is the most ancient Egyptian Goddess and "Giver of Life". 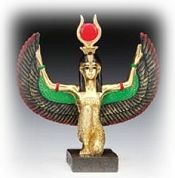 Isis stone resin figurine in gold with vivid green and red colors. Sleek hand painted reproduction of black Bastet with a gold scarab amulet on a hieroglyphic motif black base. The Reverence for the Sacredness of cats originated in Ancient Egypt. Bastet, the Cat-mother of the city of Bubastis was the benevolent aspect of Goddess Hathor the Sphinx. An Egyptian artifact at a fraction of Las Vegas or Museum store prices!! Hand painted reproduction of Bastet, the Temple Cat. Reverence for the Sacredness of cats originated in Ancient Egypt. Bastet, the Cat-mother of the city of Bubastis was the benevolent aspect of Goddess Hathor the Sphinx. An Egyptian artifact at a fraction of Las Vegas or Museum store prices!! 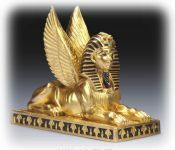 Stunning Winged Egyptian Sphinx figurine is hand painted in dramatic black, red and gold finish and sits on a gold pedestal with embossed papyrus motifs. 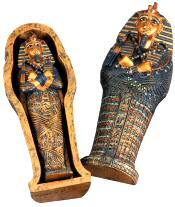 Enjoy this large Egyptian artifact at a fraction of Las Vegas or Museum store prices!! Hand painted Winged Sphinx stone resin figurine. Nefertiti means, “The beautiful one has arrived.” Nefertiti was more then just a queen, she supported her husband, promoted his religious beliefs and was depicted as a Pharaoh rather than a queen. A fabulous Egyptian artifact at a fraction of Las Vegas or Museum store prices!! Hand painted gold tone over cold cast resin. Museum quality statue of Hathor with Sun disk crown in burnished gold finish. Hathor a primordial Mother Goddess, emerged in ancient Egypt as both the mother of the sun god Ra and also his daughter the Eye of Ra. Hathor is the Goddess of Joy, Music, Fertility and feminine Love. Hand painted gold tone over cold cast resin. Every pharaoh was an incarnation of the Sun God Horus, who was the son of twin Gods Isis and Osiris. Hand crafted reproduction of Horus depicted with his Falcon face and gold Sun Disk with Moon Crescent signifying abundance and fertility. A fabulous Egyptian artifact at a fraction of Las Vegas or Museum store prices!! Hand painted gold tone over cold cast resin. Hand crafted ebony and gold statue of Anubis, the Egyptian Jackal God who ruled the body after death and the "Scales of Truth". Revered as protector of the city of Heliopolis in Ancient Egypt. An Egyptian artifact at a fraction of Las Vegas or Museum store prices!! Hand painted cold cast resin. 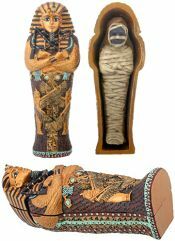 Beautiful handcrafted reproduction of an Egyptian Pharaoh Golden Sarcophagus Case includes the ancient bandaged mummy. Meticulously hand painted in vivid jewel toned colors. A fabulous Egyptian artifact at a fraction of Las Vegas or Museum store prices!! Hand painted gold tone over cold cast resin. 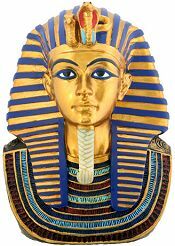 Beautiful hand crafted reproduction of Tutankhamen bust is meticulously hand painted in gold with vivid jewel toned colors. A fabulous Egyptian artifact at a fraction of Las Vegas or Museum store prices!! Hand painted gold tone over cold cast resin. Every pharaoh was an incarnation of Horus, who according to legend conquered Seth the evil god of Upper Egypt. 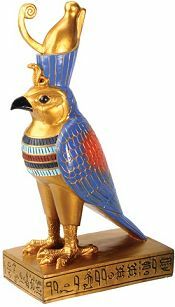 Exquisitely detailed hand crafted reproduction of Horus Falcon Statue. A fabulous Egyptian artifact at a fraction of Las Vegas or Museum store prices!! Hand painted gold tone over cold cast resin. The Egyptian Falcon is of the Peregrine Raptor species and is the fastest known creature on earth. This majestic bird of prey is a fitting choice as the incarnation of the God Horus and the living Pharaoh. 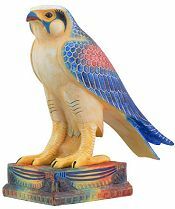 Hand painted reproduction of Egyptian Falcon statue is cold cast resin. 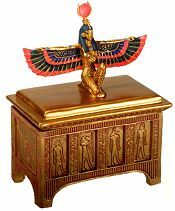 Exquisitely detailed hand crafted reproduction of a Winged Isis treasure box. Meticulously hand painted in antique gold tones, jewel colors and ebony. A fabulous Egyptian artifact at a fraction of Las Vegas or Museum store prices!! Hand painted gold tone over cold cast resin. A huge, hand crafted reproduction of the kneeling Winged Isis, the most ancient Egyptian Goddess and "Giver of Life". Shown here with her setting Sun Disk between gold horns headdress signifying abundance, fertility and the circle of life. 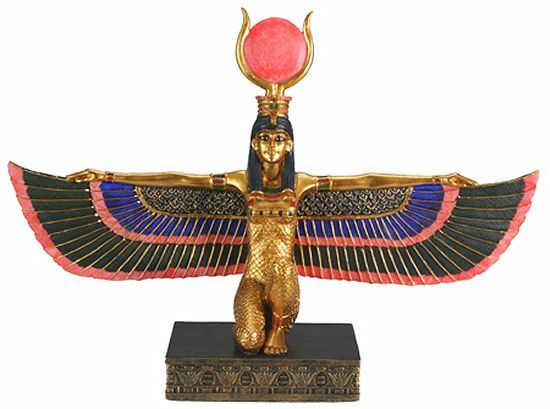 Hand painted Isis statue in gold with vivid jewel toned colors over solid stone resin. An exquisite hand painted creation representing the ancient myth of the Phoenix Rising from the ashes reborn in the fiery flames. This large vibrantly colored, open winged Phoenix captures the symbolism of renewal from the Egyptian and Greek cultures. A superior creation from the premium Myths and Legends Collection. Hand painted and crafted cast stone resin. 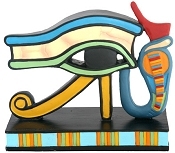 A hand painted authentic reproduction of the Wedjat or Eye of Horus Amulet on brightly colored base. It is also known as the All Seeing Eye in Masonic teachings. The Wedjhat Amulet was usually made of brightly painted Faience, a type of glazed pottery. The Eye of Horus was a powerful symbol of regeneration, protection and good health. Colorful figurine hand painted on both sides, over cold cast resin. Amazing detail in this handcrafted stylized reproduction of the Tutankhamen Golden Sarcophagus Case, includes the intricate gold encased mummy. Meticulously hand painted in vivid jewel toned colors. A fabulous Egyptian artifact at a fraction of Las Vegas or Museum store prices!! Hand painted gold tone over cold cast resin.